With the rains comes water stagnation which in turn provides the perfect breeding grounds for mosquitoes. Mosquitoes carry a lot of deadly diseases one of which is Dengue virus. Characteristic symptoms are fever, muscle pain, joint pain, skin rash and headache. In severe cases, low levels of blood platelets, very low blood pressure, blood plasma leakage and bleeding occurs. Dengue virus is transmitted via the mosquito of genus type Aedes. There are five different types of dengue virus, one type of infection provides immunity to that specific strain for life and interim protection to other types. It was first identified in the year 1779 and became a worldwide problem since the Second World War. It was studied and analysed only in the 1990’s. Currently there is no vaccination available to prevent this disease but research is going on to create a vaccine and medicines for the disease. 80% of the people who are infected have very mild symptoms. For 5% of the people have severe symptoms and for the rest it is fatal. The incubation period is usually 3 to 14 days. 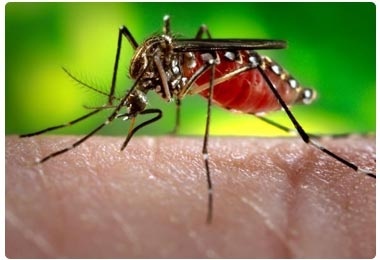 Sudden fever, headache, muscle and joint pains are typical symptoms of dengue and is also known by ?breakbone fever?. There are 3 phases to the infection: febrile, critical and recovery. Fever, more often than not is above104 F with joint pain and vomiting occur within 2 days of infection. Between 4th and 7th day, bleeding from mucous membranes in nose and mouth, small red spots in the skin and rashes are seen. The fever is inconsistent and reoccurs after a day or two. In this phase, fluid accumulation in chest and abdomen, dysfunctional organs, bleeding from gastrointestinal tract, reduced blood supply to the organs are seen. This stage is rare and transpires mostly in children and young adults. Recovery is seen when the leaked fluids are absorbed in the blood and is usually accompanied with severe itching, measured heart rate. Rarely fluid accumulation in the brain can lead to unconsciousness and seizures. The recovery period is long as fatigue lasts for several weeks. When the virus enters the blood stream along with the saliva from the mosquito, it attaches to the white blood cells. The virus then reproduces and spreads throughout the body. The white blood cells in turn produce warning signs through the proteins cytokines and interferons which produce the symptoms. It is diagnosed through physical symptoms however a blood test is the sure way of confirming the presence of the disease. Low white blood cell count, low platelets and metabolic acidosis lead to the diagnosis of dengue. Microbiological tests such as cell cultures, nucleic acid detection and virus isolation help confirm the disease. There are no explicit drugs for dengue. Hydrating is important for those who do not have severe warning signs and are not hospitalized. Intravenous hydration, blood transfusion, paracetamol are commonly prescribed for patients with warming signs. With no vaccination, the only way to protect yourself and your family from the disease is by preventing the mosquitoes from biting. This can be achieved by removing the habitats of the mosquitoes. Any open water has to be removed. If that is not possible, then insecticides or biological control agents can be used. Wearing clothes that cover most of the body.